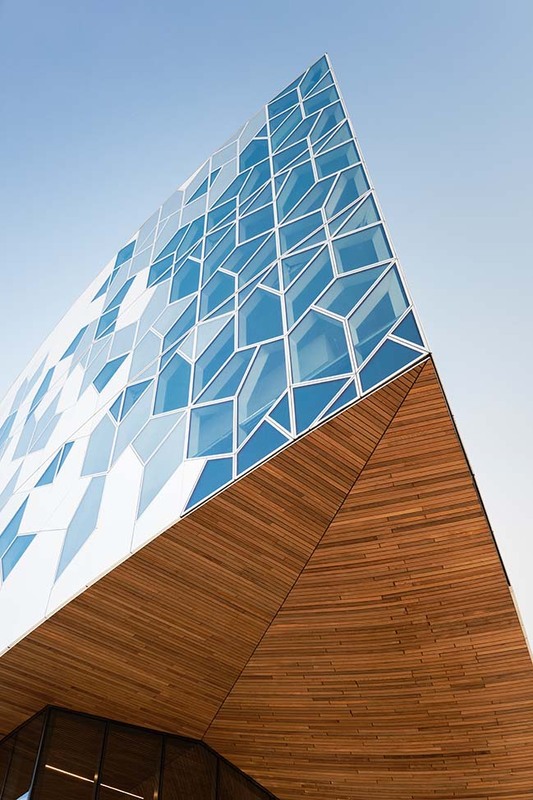 On November 1, 2018, the Snøhetta- and DIALOG-designed new Central Library has opened its doors to the public. 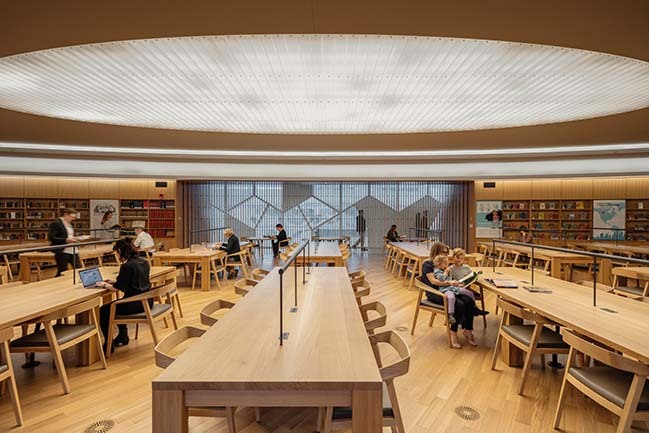 From the architect: With aims to welcome over twice as many annual visitors to its 240,000 SF of expanded facilities, the library will fill a vital role for the rapidly expanding city. 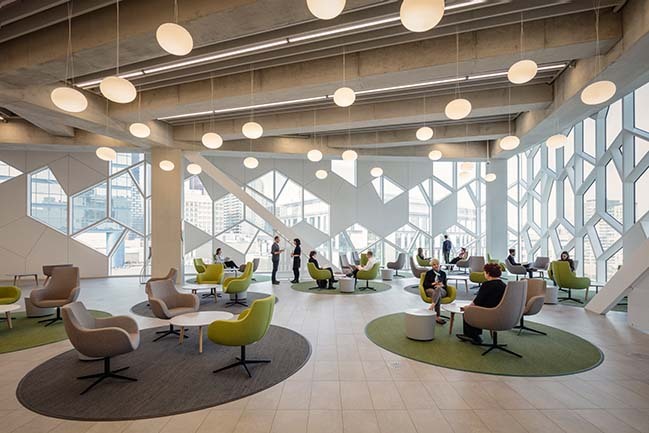 As Calgary’s largest public investment since the 1988 Olympics, the library signals the beginning of a new chapter in the life of the city, one centered on the creation and innovation of knowledge and culture. 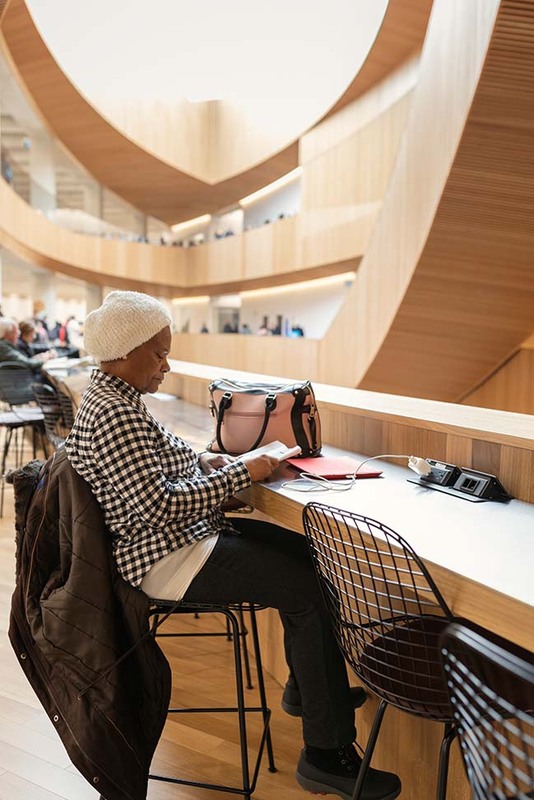 Calgary Public Library is one of the largest library systems in North America, where more than half of its residents are active cardholders, and accordingly, the new main branch was created for and inspired by its diverse inhabitants. 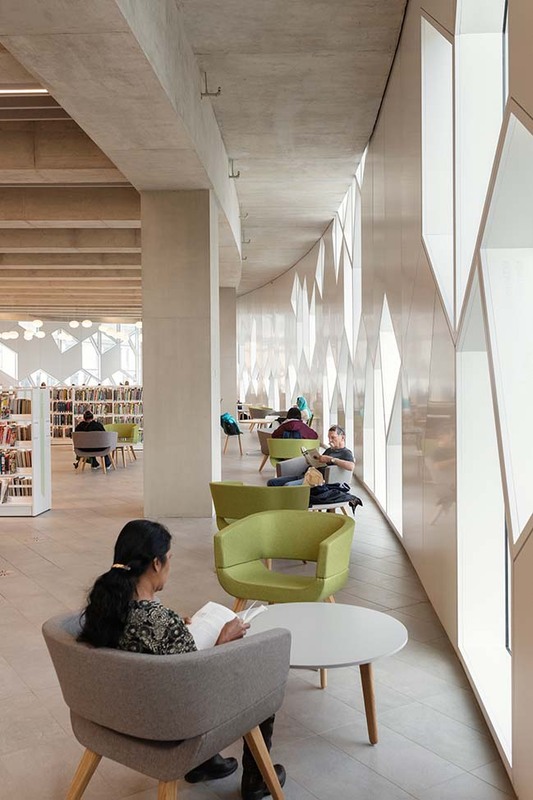 The new building provides spaces for all types of people and activities—for social interaction and exchange, for studying and learning, for quiet and introspection—championing the unique civic function that libraries provide today. 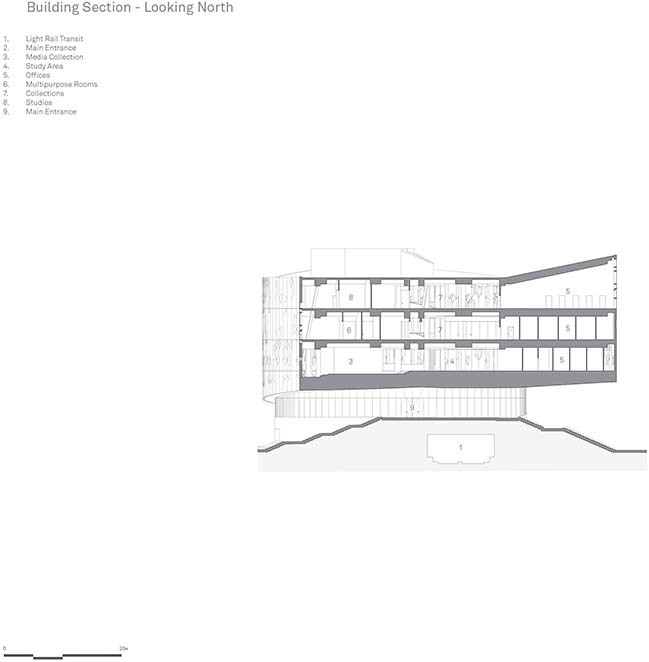 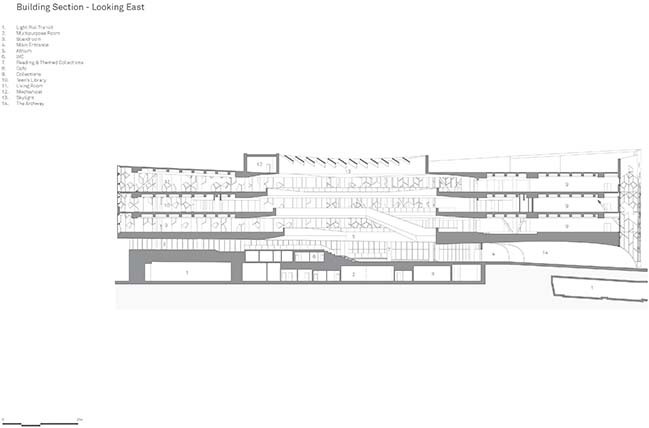 The building is sited within a complex urban condition, where a fully operational Light Rail Transit Line crosses the site from above to below ground on a curved halfmoon path, dividing Downtown and East Village. 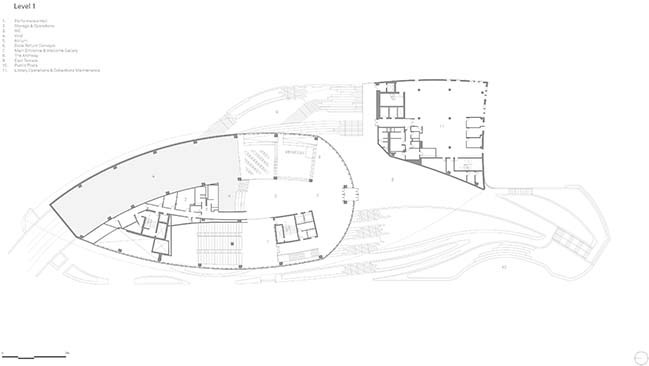 In response, the design lifts the main entry over the encapsulated train line. 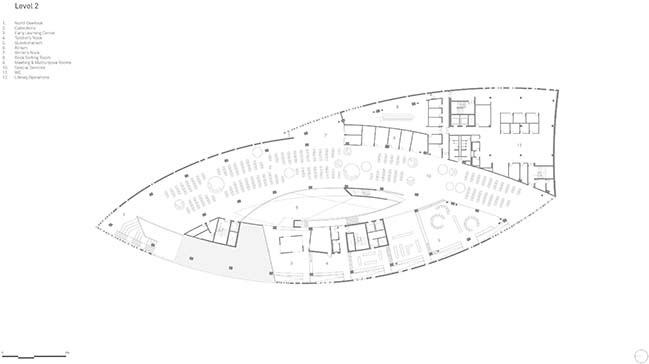 Gently terraced slopes rise up to the heart of the building, allowing for people arriving from every direction to interact with the library. 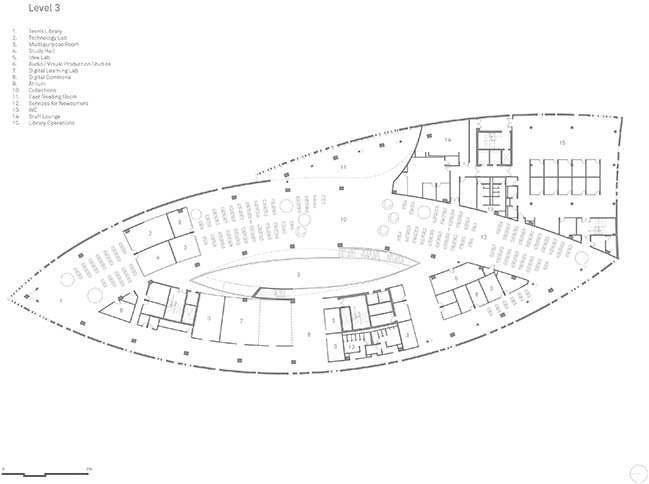 Outdoor amphitheaters nestled into the terraces provide places for people to sit and for library programs to spill outside. 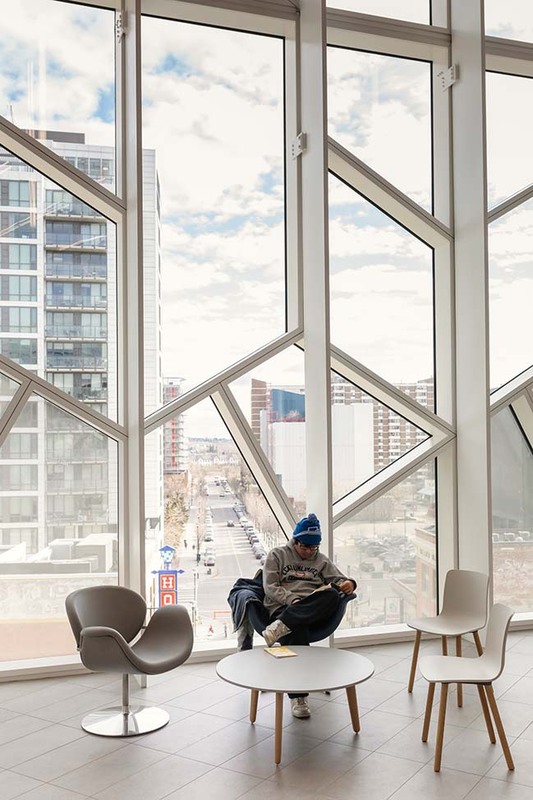 Plantings that reference the native landscape draw Calgary’s mountains and prairies into the cityscape, and line the plaza’s surrounding streets with elms and aspen trees. 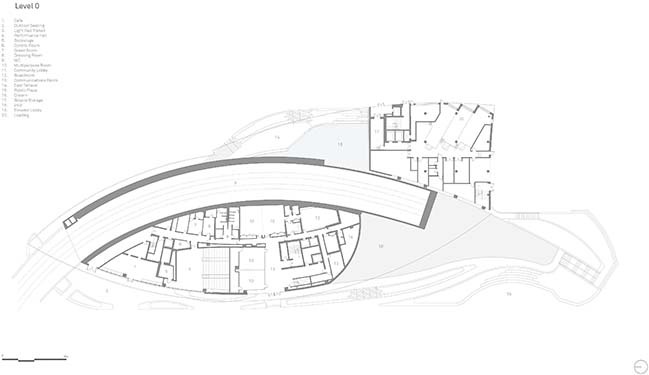 Doubling as a portal and a bridge, the entry plaza heals the previously-split seam between the two neighborhoods and re-establishes visual and pedestrian connections across the site. 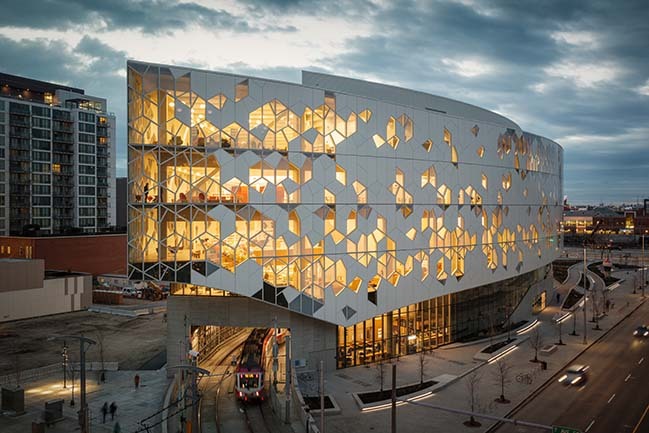 The dynamic, triple-glazed façade is composed of a modular, hexagonal pattern that expresses the library’s aims to provide a space that invites in all visitors. 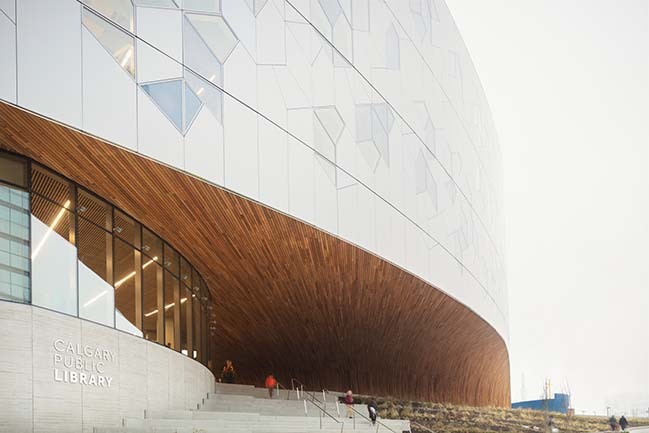 Aggregated variations on the hexagon form scatter across the building’s curved surface in alternating panels of fritted glass and occasional iridescent aluminum. 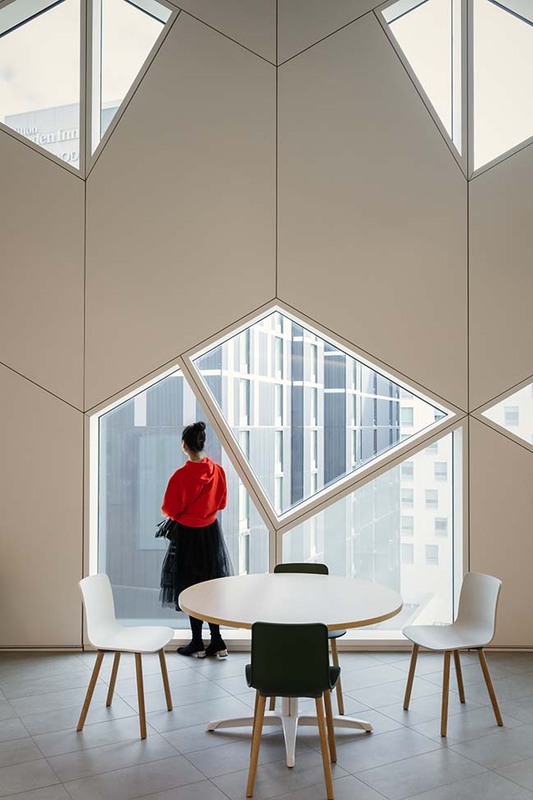 From these shapes emerge familiar forms: Parts of the pattern might resemble an open book, snowflake-like linework, or interlocking houses, anchoring the ideas of the collective and community. 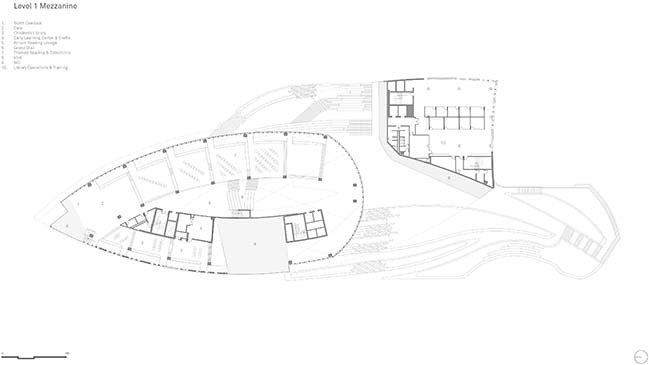 Most importantly, the entire building volume is enclosed in the same pattern, allowing all sides to function as the “front” of the building. 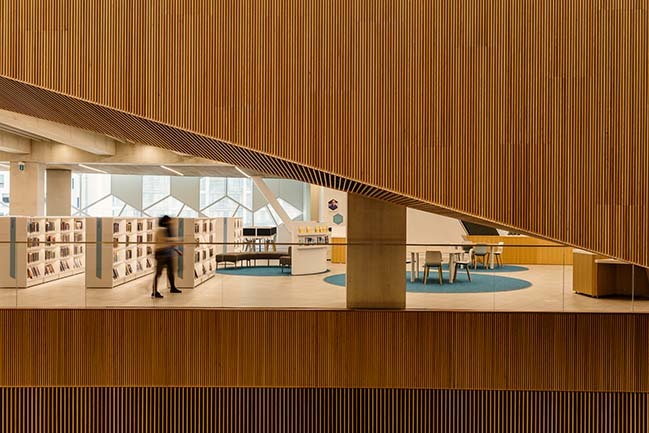 This visual vocabulary continues inside, expressed in the design of CPL’s new visual identity and wayfinding signage in the building, unifying the library’s goals of inclusivity. 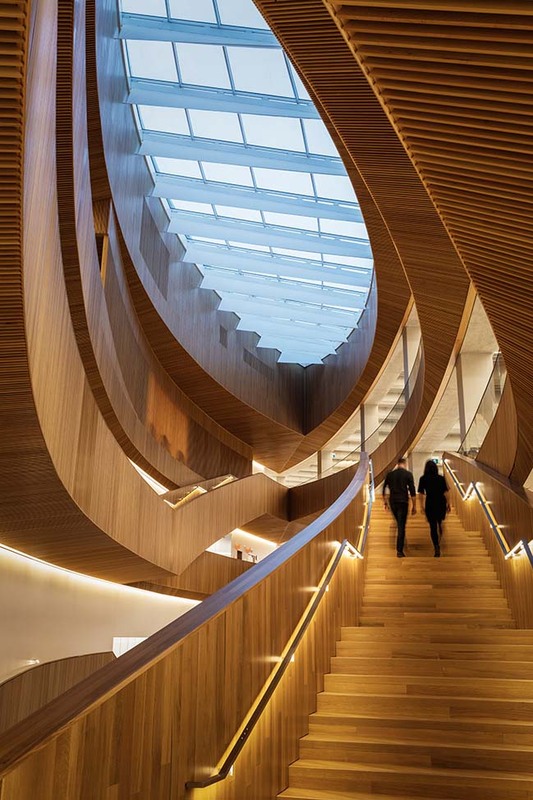 As the archway continues into the lobby and atrium, the wood spirals upwards over 85 feet to a view of the sky through the oculus. 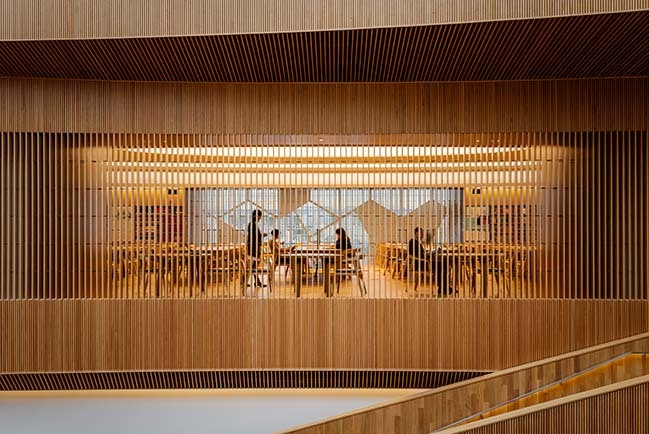 Wood slats line the perimeter of the open atrium, shaped in plan like a pointed ellipse, serving as an orientation device for people to quickly grasp the circulation and organizational logic of the library. 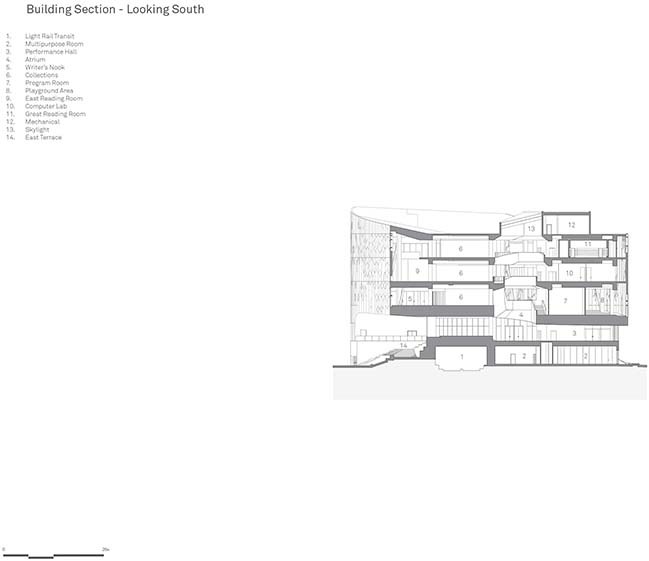 Inside, the concrete structure is left exposed and unfinished, hinting at the open-ended possibilities within. 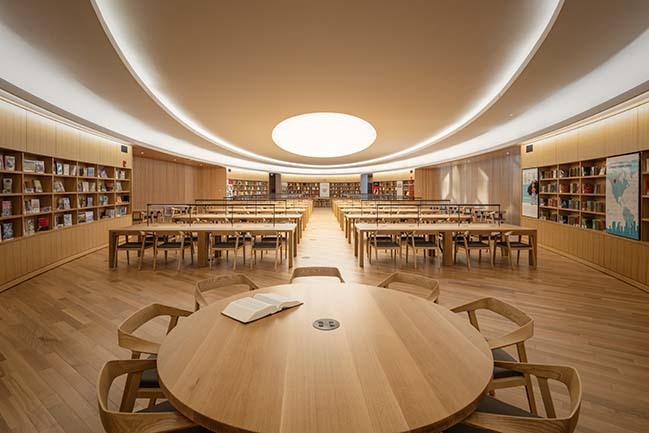 The rhythm of beams and columns are reminiscent of a stoa, the public, open-air colonnades of ancient Greek architecture that doubled as spaces of gathering and intellectual exchange. 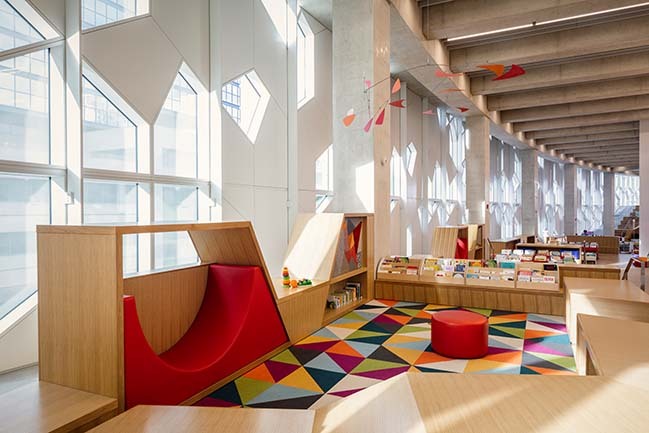 The rawness of the material palette is intended to give people the sense that the library is a place of engagement, rather than a sacrosanct repository for books. 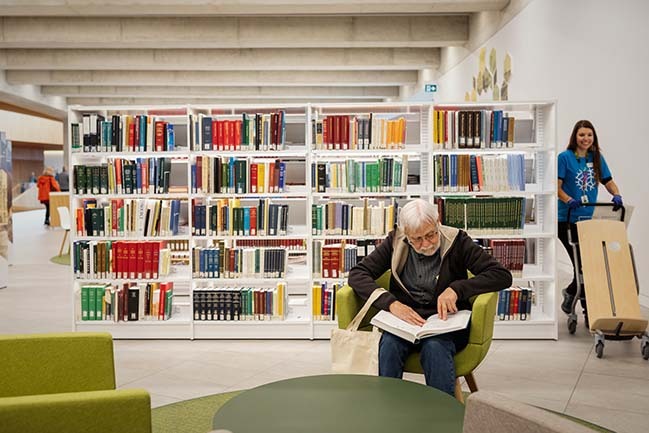 half of its 1.2M population) and plays a major role in connecting residents from all walks of life. 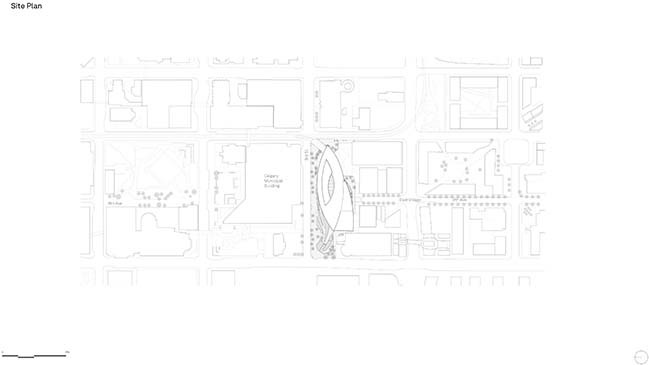 Accordingly, the new Central Library was catalyzed by a significant public engagement process. 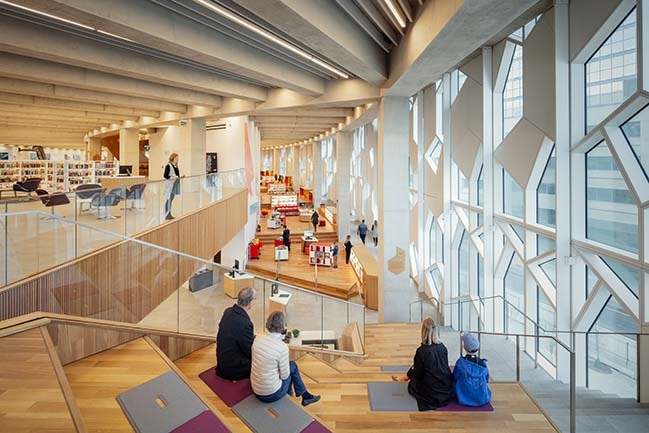 A series of programs were held in 2012, where more than 16,000 people provided input for what they hoped to see in the Library’s role within the community and its function. 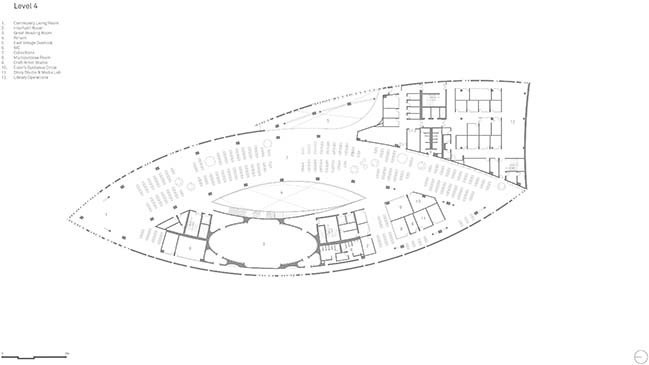 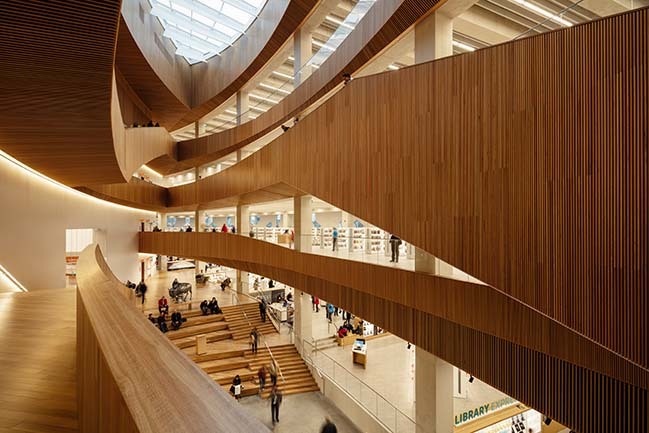 In 2013, CPL and CMLC hosted an international design competition to select the architecture and landscape architecture team to realize the Central Library. 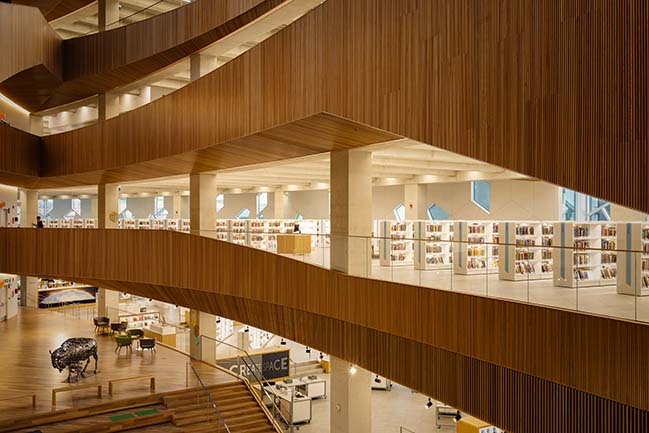 The Snøhetta- and DIALOG-designed library reached substantial completion in July 2018, was handed over to Calgary Public Library in September, and opened on time and on budget to the public on November 1, 2018. 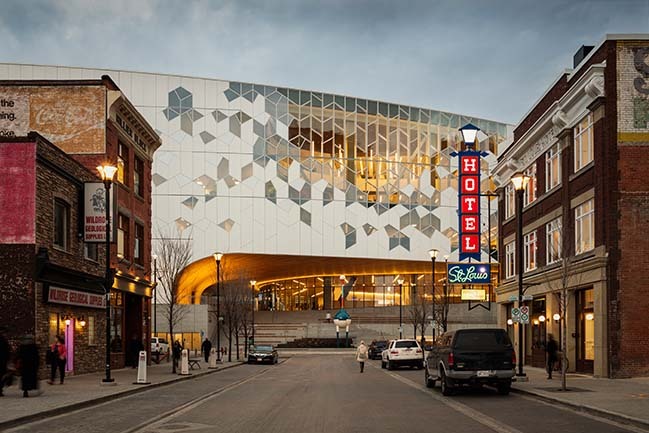 The new Central Library will join Studio Bell, the Arts Commons, and the Glenbow Museum as part of a burgeoning cultural campus in downtown Calgary and the East Village.